Dr. Haddon has given me this unpublished Torres Straits figure. 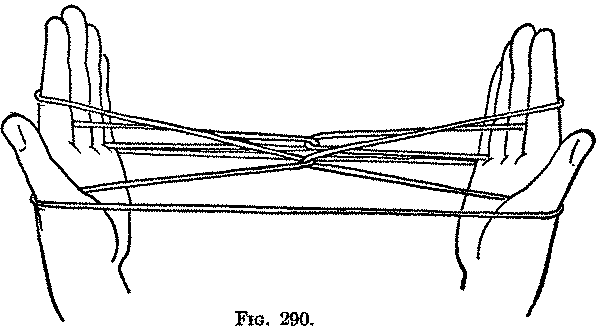 Second: Exchange the index loops so that they will catch, by bringing the hands together (with the fingers pointed toward one another) and putting with the left index the left index loop on the right index over the right index loop, and down to the base of the finger; then lift off with the left index the original right index loop, and separate the hands. In this way the right index loop is drawn through the left index loop (Fig. 290). Third: Release the loop from the right index. 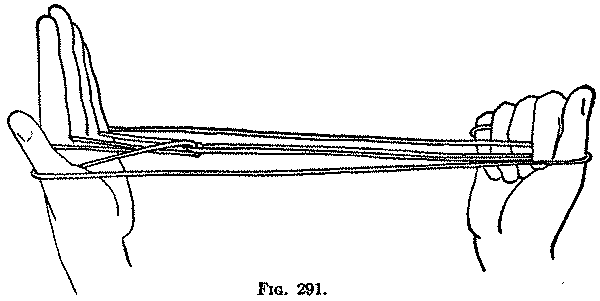 You now have a loop on each thumb and little finger and a loop on the left index; the loops on the left hand form the fish-spear, which is brought out more plainly by closing all the fingers of the right hand down on the palm, and letting the strings of the little finger loop come out between the index and middle finger (Fig. 291). Fourth: The spear is "cast" from the left hand to the right hand, by putting the right index down between the right far thumb string and the right near little finger string, and then from below into the left index loop (Fig. 292), and drawing the loop joining the left hand loops out to the right on the back of the right index. 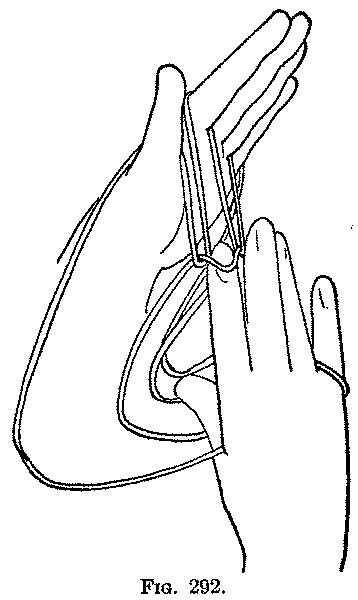 Then release the loop from the left index and close the fingers of the left hand down on the palm (Fig. 293). The only point of interest in this figure is the fact that the finished pattern is formed first on one hand, and then may be transferred to the other hand. The Second movement occurs again only in the next two figures.